I love turquoise jewelry. There is an earthiness about the natural finish of the stones and the lovely color that just cries out to be worn. 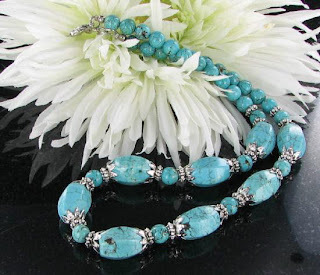 I've recently purchased a large collection of genuine natural turquoise necklaces. There are several different styles and designs all with fabulous stones. I'll be listing them in my ebay shop Carolina Collections Vintage Jewelry, and at Vintage Jewelry Mall over the next few weeks. Prices are reasonable - from $15.99 to $25 or so. The pretty style shown here is available for $23.99 and features gorgeous turquoise beads couple with filigree spacer beads and end caps. Be sure to check back soon for more of these lovely styles.